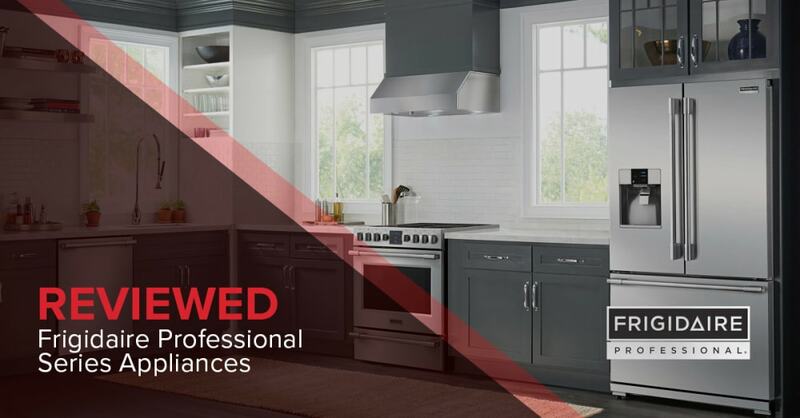 The Frigidaire Professional Series features precisely the kind of high-quality kitchen appliances that you can rely on, without breaking the bank. High quality products with modern pro-style that will be continuously reliable for several years, at an affordable price. We recently updated this article to incorporate the new and elegant Frigidaire Professional glass door refrigerator FPGU19F8TF which offers luxury at an affordable price point. This series of large home appliances were designed to fit into the home environment, combining the durability and longevity of professional-grade appliances with the sleek and modern attractive looks of the best home products. Here are three good reasons to consider a Frigidaire Professional appliance for your home. It doesn’t matter whether you live in a tiny studio apartment or a sprawling ranch-style home; if your appliances are stylish, well-made and well-designed, they will make your kitchen look and feel good - and there’s nothing better than whipping up fantastic food creations in a kitchen that feels like it could feature in a design magazine. The Frigidaire Professional range has been designed not only to look good but to handle the heavy-duty home use, which ultimately means they stay looking great for longer than your usual home appliance. For example, the Smudge-Proof™ coating you find on the stainless steel finish is of a considerably higher quality than with most fingerprint-resistant stainless steel finishes. You will not have a messy look in your kitchen. The most popular reason people give for buying low-cost appliances instead of high-quality appliances is affordability. If you don’t have the money to buy expensive, premium quality products, you just don’t have it, after all. That’s where products like the Frigidaire Professional range are unique - they give you top quality, reliability, and consistency at reasonable prices. There are several advantages to having all of your major appliances from the same manufacturer. Firstly, it reduces the number of contacts you need to keep track of in case something does go wrong; you just need one port of call. Secondly, you begin to know what to expect; the quality and performance of your appliances will be consistent and predictable - and because of their outstanding quality, that predictability and consistency is a good thing. Not to mention that Frigidaire runs terrific promotions for full kitchen packages from time to time. The Frigidaire Professional series covers all your major kitchen appliances, including refrigerators, ranges, cooktops, wall ovens, dishwashers, and microwaves. But while there are plenty of options available, the Professional series doesn’t overwhelm you with hundreds of choices that each differs only very slightly - they’ve refined the products to give you the best options and to make choosing simple and easy. Together, these two items are a full 64” wide, giving you 32” of space each, all of which means a comfortable, spacious, fully built-in fridge. Depending on which trim you choose, the height comes to between 75” and 80”. Luxurious finish utilizing FPFU19F8RF Freezer combined with FPRU19F8RF Refrigerator using the trim kit TRIMKITEZ2 for seamless one-piece look. At 36” width, this fridge offers a variety of options, including full depth, counter depth and the choice of an ice maker built into the door. Induction cooktops are quickly becoming one of the most popular choices in cooktops. They offer outstanding temperature control with higher accuracy than gas or electric and are excellently priced. We keep it simple with our Professional series wall ovens, offering two excellent choices - the single oven or the double oven. Both options include convection and self-cleaning and thanks to the PowerPlus technology that’s built-in, you get much faster preheating times. You’ll also enjoy precision cooking with the temperature probe, and dual timers on the double oven model that allow you to set different times for the two ovens. Choose from the Basic model that consists of all the latest cleaning technology, or upgrade to the Upscale model that includes a SpacePro third rack, has Energy Star certification, and a PowerBright floor light to indicate operation. This model also incorporates the fan-assisted EvenDry system, which evenly recirculates air for enhanced moisture removal. Quick note - During promotional seasons we come across strong promotions from Frigidaire with a free upgrade to the higher level dishwasher. A surprising strong differentiator for Frigidaire Professional Series is their high-quality microwave ovens. FPMO209RF is the most popular product in the line-up. This microwave can be installed as a built-in unit one with your cabinets. Over-the-range microwaves are able to vent at 400 CFM high capacity. Model FPBM3077RF even offers convection cooking. The latest addition is a 30" convection microwave oven FPMO3077TF with a drop-down door a true built in appliance at an affordable price point under $1000. Whether you’re doing a full kitchen renovation, or just need to replace one or two items, the Frigidaire Professional series will give you beautiful, hard-working, long-lasting quality that makes your kitchen the heart of your home. If you need durability and reliability, look at this brand to turn your kitchen into one you’ll be proud of.